This Bird weighs three ounces and a quarter. The Bill is straight, sharp, and somewhat flat towards the End. Between the Eye and the Notril is a yellow Spot. The Crown of the Head is brown, with a dusky white lift running from the Bill along the middle of it. A black lift, of about an inch long, extends downwards from the Eye. The sides of the Head are light gray. The Wings and upper part of the Body are of a Partridge-coulour. The Breast has a large black Mark, in form of a horse-shoe; except which, the Throat and all the under part of the Body is yellow. 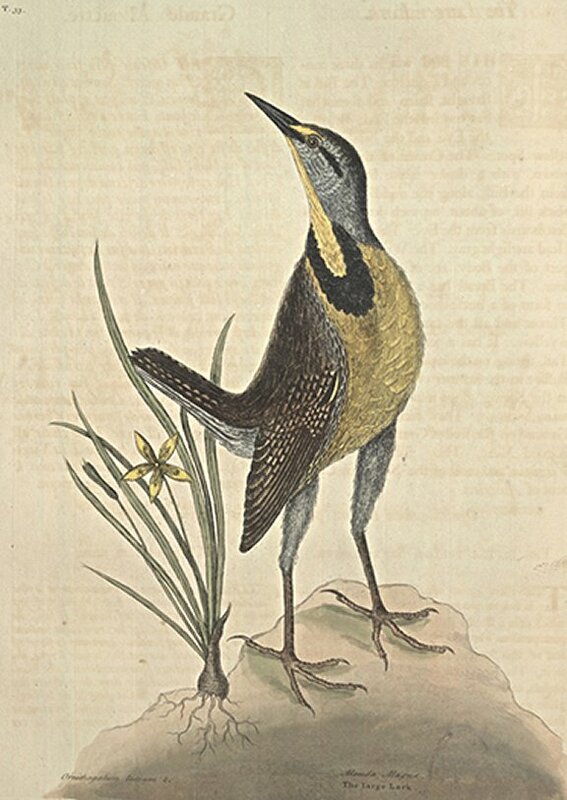 It has a jetting Motion with its Tail, sitting on the tops of small Trees and Bushes in the manner of our Bunting; and, in the Spring, sings musically, though not many Notes. They feed mostly on the Ground on the seed of Grasses: Their flesh is good Meat. They inhabit Carolina, Virginia and most of the Northern Continent of America. This Plant grows usually not above five inches in height, producing many grassy leaves, from which rises a slender stalk bearing a yellow Star-like pentapetalous Flower. It has five Stamina, every leaf of the flower having one growing opposite to it. The Flower is succeeded by a small long capsula, containing many little black Seeds: This plant grows plentifully in most of the open Pasture lands in Carolina and Virginia, where these Larks most frequent and feed on the Seed of it.